The twins Jacob and Evie are not the only characters in Assassin's Creed: Syndicate. There is also the secret character Lydia Frye, the granddaughter of protagonist Jacob Frye, who was also trained by the Brotherhood of Assassins and therefore she has the same skills and talent trees like her relatives. How do you unlock and taking part with her in the First World War, we show you below. To take on the role of Lydia Frye you have to find a hidden mode within London. However, this is only accessible in sequence 6, after about 15 hours of play time. Your destination is the River Thames in London. 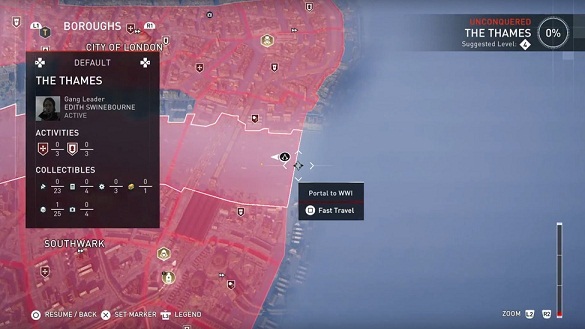 At the easternmost point of the map in the middle of the river there is a quick travel portal located to the events of World War I, where Lydia Frye is available for you. The exact location of the portal you can see on the map below. Go through the portal, you are now on as Lydia Frye in London at the time of World War I. You can now leave the portal at any time or walk back down to do missions. In London you will be welcomed by Winston Churchill and sends you on missions to fight against the Germans, the ominous circling over the night sky in zeppelins and airplanes. During your stay you are allowed to explore a considerable area around the Tower Bridge. They may consist of your mission is to hunt spies, to free bases of enemies or even shoot down with anti-aircraft guns of the German aircraft. Have you completed all the missions in the simulation of World War I, you will also get the Achievement / Trophy The Home Front.